Watch a quick summary of the changes above. This past winter the NJSIAA approved a proposal with changes to the cross country advancement out of Groups to the Meet of Champions. This article covers all those adjustments and a quick video has also be made embedded above. The changes were first announced back in November after the annual Cross Country Committee meeting, which includes coaches from large, small, public and, non-public schools as well as timers and meet officials. After long discussion this committee settled on all the changes below. Top 2 teams from each Group automatically advance (12 total teams). Previously this was the top three from each Group. The next 8 wild card teams will advance through a results merge process which combines the individual finisher times from every race and re-scores them together. The previous rule involved choosing the next three non-qualified teams based on their total team time. The merge process will be done through a MileSplit virtual meet combining all the times that day from every Group race and scoring them as a brand new meet. 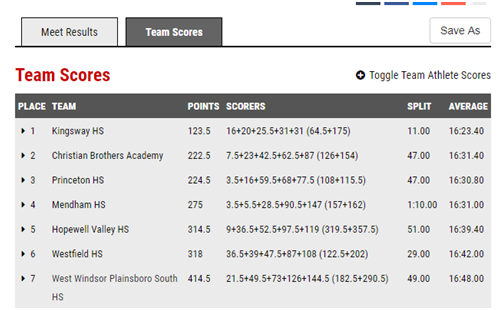 This creates team scores just like usual results, ranking teams based on their comparable meet times and athlete places. The NJSIAA would skip over teams already qualified through their Group race and pick the next best eight scored teams in the team standings. The individual wild cards system will remain the same, the top 10 individuals who haven't already qualified either through their team, race, or wild card team will advance. This will be a two year pilot program to gather additional data for the NJSIAA to review and decide if it is here to stay for good. Sectionals to Group Championships advancement remains the same as it has been in previous years. How will athletes with the same time work? The virtual meet will have athletes who crossed with the same time share the points they would have scored together. Example: Cross country gives finishers points based on their place. If two athletes finish at 16:05 for 7th in the virtual meet, they take up 7th and 8th in the rankings meaning (7+8) 15 total points. They are both listed as 7th but are given 7.5 points. The give and take: This includes athletes who had the same time in the same race and were placed differently, to make the merge as fair as possible while combining separate races this had to happen. It is scored as a brand new "virtual meet". You can run your own virtual meet any time. This can be to merge a meet that has already happened, to preview an upcoming championship, or to make a meet up from scratch and pit whoever you choose against each other.